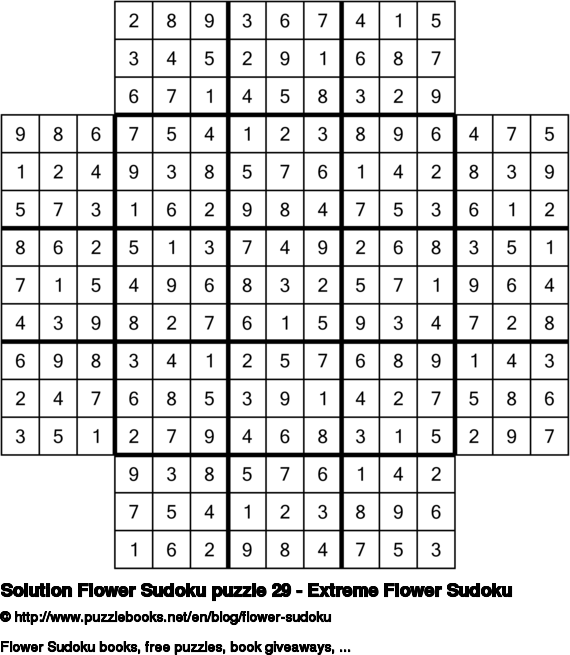 Click here to view the solution for Flower Sudoku puzzle 30 - Extreme Flower Sudoku. I hope you managed to solve it and had a lot of fun trying to do so. Addicted to Flower Sudoku puzzles? Today I have another Flower Sudoku puzzle for you. Lots of pleasure trying to solve it. How to play Flower Sudoku: Flower Sudoku has five Sudoku puzzles in layout. The center grid is fully covered by the remaining four sub-puzzles. For each grid the goal is to fill in the empty cells, one number in each, so that each column, row, and region contains the numbers 1-9 exactly once. This means that the numbers must be placed correctly for all the five grids. Click here to view the solution for Flower Sudoku puzzle 29 - Extreme Flower Sudoku. I hope you managed to solve it and had a lot of fun trying to do so. I always find it gratifying when I finally solve a Flower Sudoku puzzle. I felt thrilled when I solved this Flower Sudoku puzzle. Click here to view the solution for Flower Sudoku puzzle 28 - Medium Flower Sudoku. I hope you managed to solve it and had a lot of fun trying to do so. Flower Sudoku puzzles are logic puzzles that are an ideal brain training. Click here to view the solution for Flower Sudoku puzzle 27 - Easy Flower Sudoku. I hope you managed to solve it and had a lot of fun trying to do so. Scientists have shown that solving logic puzzles is really good for your brain. Today we have another brain teaser for you. Enjoy today's Flower Sudoku puzzle. Click here to view the solution for Flower Sudoku puzzle 26 - Medium Flower Sudoku. I hope you managed to solve it and had a lot of fun trying to do so.